Ahead of meeting between North Korean leader and Trump, alleged social media account of North Korean Foreign Minister blasts Israeli PM. Israel’s Foreign Ministry condemned a social media post directed at Prime Minister Binyamin Netanyahu Monday, after an account purporting to be represent North Korea’s Foreign Minister derided Netanyahu as a “stinking Zionist”. On an account supposedly managed by North Korean Foreign Minister Ri Yong-Ho, several comments were released mocking a recent video statement released by Prime Minister Netanyahu, in which the Israeli premier made an "unprecedented offer" to the Iranian people on Sunday to help solve Iran's water crisis by creating a Farsi website with detailed plans on Israeli water conservation technologies and strategies. "The Iranian people are victims of a cruel and tyrannical regime that denies them vital water," Netanyahu said. "Israel stands with the people of Iran, and that is why I want to help save countless Iranian lives." In response, the account derided Netanyahu as a “Stinking Zionist”. 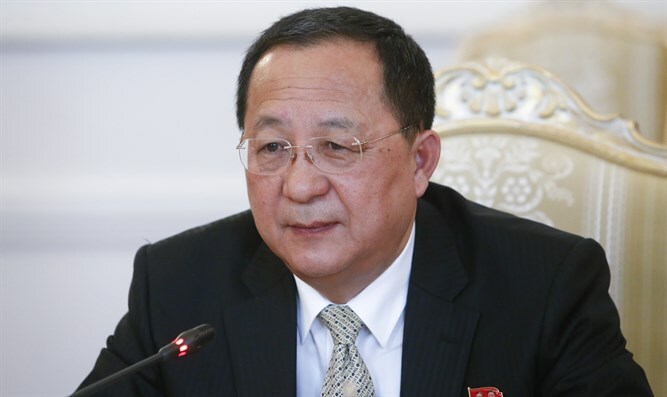 It has yet to be established, however, if the account used to send the offensive tweets is in fact linked to the North Korean foreign minister, or if it is a fictitious account. North Korea’s Kim Jong Un and President Trump are slated to meet for a historic summit in Singapore’s Sentosa Island on Tuesday, the first ever meeting between a sitting US president and a North Korean leader. Trump arrived in Singapore on Sunday ahead of Tuesday’s summit, which will take place at 9:00 a.m. local time at the Capella Hotel on Singapore's Sentosa Island. The president expressed optimism ahead of the summit, saying Monday he believed “things can work out very nicely” with the North Korean leader.